This article is about the cricket ground in London. For other uses, see Oval (disambiguation). "Surrey Cricket Ground" redirects here. For the cricket ground in Sri Lanka, see Surrey Village Cricket Ground. "Kennington Oval" redirects here. It is not to be confused with Kensington Oval. The Oval, currently referred to for sponsorship purposes as the Kia Oval, is an international cricket ground in Kennington, in the London Borough of Lambeth, in south London. The Oval has been the home ground of Surrey County Cricket Club since it was opened in 1845. It was the first ground in England to host international Test cricket in September 1880. The final Test match of the English season is traditionally played there. In addition to cricket, The Oval has hosted a number of other historically significant sporting events. 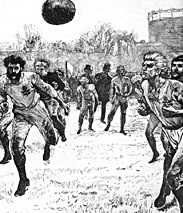 In 1870, it staged England's first international football match, versus Scotland. It hosted the first FA Cup final in 1872, as well as those between 1874 and 1892. In 1876, it held both the England v Wales and England v Scotland rugby international matches and, in 1877, rugby's first Varsity match. It also hosted the final of the 2017 ICC Champions Trophy. The clock by the Members' entrance. The Oval is built on part of the former Kennington Common. Cricket matches were played on the common throughout the early 18th century. The earliest recorded first-class match was the London v Dartford match on 18 June 1724. However, as the common was also used regularly for public executions of those convicted at the Surrey Assizes (it was the south London equivalent of Tyburn), cricket matches had moved away to the Artillery Ground by the 1740s. Kennington Common was eventually enclosed in the mid 19th century under a scheme sponsored by the Royal Family. In 1844, the site of the Kennington Oval was a market garden owned by the Duchy of Cornwall. The Duchy was willing to lease the land for the purpose of a cricket ground, and on 10 March 1845 the first lease, which the club later assumed, was issued to Mr. William Houghton (then president of the progenitor Montpelier Cricket Club) by the Otter Trustees who held the land from the Duchy "to convert it into a subscription cricket ground", for 31 years at a rent of £120 per annum plus taxes amounting to £20. The original contract for turfing The Oval cost £300; the 10,000 grass turfs came from Tooting Common and were laid in the Spring of 1845 allowing for the first cricket match to be played in May 1845. Hence, Surrey County Cricket Club (SCCC) was established in 1845. The popularity of the ground was immediate and the strength of the SCCC grew. On 3 May 1875 the club acquired the remainder of the leasehold for a further term of 31 years from the Otter Trustees for the sum of £2,800. In 1868, 20,000 spectators gathered at The Oval for the first game of the 1868 Aboriginal cricket tour of England, the first tour of England by any foreign side. Thanks to C.W. Alcock, the Secretary of Surrey from 1872 to 1907, the first Test match in England was played at The Oval in 1880 between England and Australia. The Oval, thereby, became the second ground to stage a Test, after Melbourne Cricket Ground (MCG). In 1882, Australia won the Test by seven runs within two days. The Sporting Times printed a mocking obituary notice for English cricket, which led to the creation of the Ashes trophy, which is still contested whenever England plays Australia. The first Test double century was scored at The Oval in 1884 by Australia's Billy Murdoch. Surrey's ground is noted as having the first artificial lighting at a sports arena, in the form of gas-lamps, dating to 1889. The current pavilion was completed in time for the 1898 season. In 1907, South Africa became the second visiting Test team to play a Test match at the ground. In 1928, the West Indies played its first Test match at The Oval, followed by New Zealand in 1931. In 1936, India became the fifth foreign visiting Test side to play at The Oval, followed by Pakistan in 1954 and Sri Lanka in 1998. Zimbabwe and Bangladesh have yet to play a Test match at The Oval. The Oval is referenced by the poet Philip Larkin in his poem about the First World War, "MCMXIV". During World War II, The Oval was requisitioned, initially housing anti-aircraft searchlights. It was then turned into a prisoner-of-war camp, intended to hold enemy parachutists. However, as they never came, The Oval was never actually used for this purpose. The first One Day International match at this venue was played on 7 September 1973 between England and West Indies. It hosted matches of the 1975, 1979, 1983, and 1999 World Cups. It also hosted five of the fifteen matches in the 2004 ICC Champions Trophy, including the final. The Oval once held the record for the largest playing area of any Test venue in the world. That record has since been surpassed by Gaddafi Stadium in Pakistan, although The Oval remains the largest in Great Britain. Billionaire Paul Getty, who had a great affinity for cricket and was at one time SCCC President, built a replica of The Oval on his Wormsley Park estate. The famous gasholders just outside the ground were built around 1853. With the gasholders long disused, there was much speculation as to whether they should be demolished; however, many believe they are an integral part of The Oval's urban landscape and, therefore, their future looks secure. In 2016 the main gasholder was given official protected status as a historically important industrial structure. On 20 August 2006, The Oval saw the first time a team forfeited a Test match. Pakistan were upset after umpires Darrell Hair and Billy Doctrove docked them five runs and changed the ball after ruling that the team had tampered with it on the fourth day of the final Test against England. Pakistan debated the matter during the tea break and then refused to come out for the final session in protest. By the time they relented and decided to resume, the umpires had already called time on the match and awarded the game to England by default. The Oval hosted its hundredth Test, against South Africa, on 27 July, 2017, becoming the fourth Test venue in the world after Lord's, MCG and SCG to do so. Moeen Ali also became the first player to ever take a Test hat-trick at The Oval, bowling out South Africa in the second innings to win the match. In Tests, the highest team score at The Oval is 903/7 declared by England against Australia on 20 August, 1938. The leading run scorers are Len Hutton (1,521 runs), Alastair Cook (1,217 runs) and Graham Gooch (1,097 runs). The leading wicket takers are Ian Botham (52 wickets), Derek Underwood (45 wickets) and James Anderson (44 wickets). In ODIs, the highest team score at The Oval is 398/5 by New Zealand against England on 12 June 2015. The leading ODI run scorers are Eoin Morgan (573 runs), Marcus Trescothick (528 runs) and Ian Bell (473 runs). The leading ODI wicket takers are James Anderson (30 wickets), Darren Gough (13 wickets) and Andrew Flintoff (12 wickets). The north-western end of The Oval is traditionally known as the Vauxhall End, as it is nearer to the district of Vauxhall and its railway station. The opposite end (south-east) is known as the Pavilion End as it is the location of the Members' Pavilion. At the end of the 2002 cricket season, Surrey started redeveloping the Vauxhall End. The development included demolishing the outdated Surridge, Fender, Jardine, and Peter May north stands, and creating in their place a single four-tier grandstand, currently known as the OCS stand, as it is sponsored by Outsourced Client Solutions International Facilities Management Services. This work was completed in May 2005 and increased ground capacity to around 23,000. In January 2007, Surrey CCC, announced plans to increase capacity by a further 2,000 seats, this time by redeveloping the Pavilion End. The Lock, Laker, and Peter May south stands were to be replaced by a new stand, which would have a hotel backing on to it. The Surrey Tavern at the entrance to the ground would be demolished, and a new pedestrian plaza would be created in its place, improving access to the ground and opening up views of the historic pavilion. These plans were delayed by objections raised by the Health & Safety Executive as the ground is close to a gasometer. Planning permission was eventually granted, but not before the credit crunch struck, as a result of which the plans were not proceeded with. In 2009, four masts of semi-permanent telescopic floodlights costing £3.7m were installed for use in late-day through evening matches. The floodlights were especially designed to comply with strict residential planning regulations to lessen their visual impact and any light overspill to residents, as well as to improve the game experience within the ground by reducing excess glare that can affect players, umpires, broadcasters and spectators. Precision reflector systems were fitted for tight beam control to decrease overspill and direct light only where needed. Each mast was made extendable to a maximum height of 47.6 metres (156 ft) and, when not in use, retractable to 30 m (98 ft). At the end of each season, all four masts can be removed and stored away. After the 2013 season, a new project was started to add 'wings' to either side of the OCS Stand at the Vauxhall End of the ground. The development was finished in time for the start of the 2014 season. Each 'wing' added 500 seats, increasing the capacity from 23,500 to 24,500. In September 2015, the Peter May and Tony Lock stands were demolished, to be replaced by a single new and much larger stand named after Peter May. May led Surrey to their sixth and seventh consecutive County Championships in 1957 and 1958 and also captained England from 1955 to 1961, winning the Ashes in 1956. Construction of the new stand, which cost around £10m, began in September 2015. It officially opened on 15 May 2016, increasing the capacity of the ground by 1,300 seats to 25,300. Following the demolition of the Tony Lock stand, the club renamed the Laker Stand as the Lock/Laker Stand, continuing to honour the contribution made by the spin partnership of Tony Lock and Jim Laker, who collectively took 3,108 wickets for the club. The Oval is also an important site in the historical development of football in England, before a separate national stadium was constructed specifically for the sport. Football had been played in this part of London for many years prior to the inauguration of The Oval: "The Gymnastic Society", arguably the world's first football club, met regularly at Kennington Common during the second half of the eighteenth century to play the game. Between 1950 and 1963 amateur club Corinthian Casuals played at The Oval, with the pitch at the Vauxhall End. The Oval was the venue for the first representative football match in the world on 5 March 1870, England against Scotland, organised by The Football Association. The game resulted in a 1–1 draw, but is not recognised by FIFA as the first ever official international match because the Scotland team was selected only from London-based Scottish players. Similar representative international matches between England and Scotland took place at The Oval until February 1872. On 8 March 1873, the England national team beat Scotland 4–2 in the first officially recognised international match to be played in England. England continued to play occasionally at The Oval until 1889. The Oval was the site of the first ever FA Cup final, and also both semi-final matches. On 16 March 1872, The Wanderers beat the Royal Engineers 1–0 to win the first ever FA Cup. This final was notable for the Engineers' then innovative footballing style of teamwork rather than individual play. C. W. Alcock, Secretary of The Football Association, was the prime mover in the creation of the competition. He had also just become Secretary of Surrey CCC, so The Oval was the natural choice of venue for the final. Alcock was also captain of the successful Wanderers side. Apart from 1873 The Oval hosted all subsequent FA Cup finals until 1892. The Oval is one of two grounds (Bramall Lane in Sheffield being the other) to have staged England football and cricket internationals and FA Cup finals. The Oval also hosted the first Rugby Union international match to be held in England, between England and Scotland, in 1872. On Wednesday 3 March 1875, The Oval held the final of the United Hospitals Challenge Cup, the oldest rugby union cup competition in the world. As well as being an international sporting venue, The Oval has a conference and events business. The Corinthian Roof Terrace built on the OCS Stand in 2013 features panoramic views of the London skyline. The ground has also hosted other events, including hockey fixtures and concerts. The Oval has hosted exhibition matches for Australian rules football. The first such match was held between Carlton and a team of All-Stars in 1972. In 2005, a record crowd for Australian rules football in England (18,884) saw the Fremantle Dockers defeat the West Coast Eagles. In 2012, approximately 10,000 attended a post-season exhibition match between Port Adelaide and the Western Bulldogs, which Port Adelaide won by 1 point. In October 2011, the ground served as the practice facility for the NFL's Chicago Bears. ^ "KIA OVAL PLANS TO EXPAND TO 40,000". 8 June 2017. ^ "Surrey unveil Kia deal – Domestic – News Archive – ECB". www.ecb.co.uk. Retrieved 26 June 2016. ^ "The Kia Oval & Surrey County Cricket Club | Kia Motors UK". www.kia.co.uk. Retrieved 7 June 2016. ^ "The Kia Oval". visitlondon.com. Retrieved 7 June 2016. ^ a b "Archive / History – Kia Oval". The History Of Surrey County Cricket Club | Club and Ground History | Kia Oval. Retrieved 7 June 2016. ^ "Kennington: Introduction and the demesne lands | British History Online". www.british-history.ac.uk. p. 14. Retrieved 26 June 2016. ^ "Kennington: Introduction and the demesne lands | British History Online". www.british-history.ac.uk. p. 20. Retrieved 26 June 2016. ^ "Test Cricket Tours – Australia to England 1930". test-cricket-tours.co.uk. Retrieved 7 June 2016. ^ "Kennington Oval | England | Cricket Grounds | ESPN Cricinfo". Cricinfo. Retrieved 26 June 2016. ^ Department, Guardian Research (13 May 2011). "5 March 1870: England v Scotland at The Oval". the Guardian. Retrieved 7 June 2016. ^ "FA Cup Final Anniversary – Kia Oval". Kia Oval. 16 March 2012. Retrieved 26 June 2016. ^ "FA Cup Final Anniversary – Kia Oval". Kia Oval. 16 March 2012. Retrieved 7 June 2016. ^ "England – FA Challenge Cup 1873–1874". www.rsssf.com. Retrieved 26 June 2016. ^ "England – FA Challenge Cup 1891–1892". www.rsssf.com. Retrieved 26 June 2016. ^ "Kennington Oval | England | Cricket Grounds | ESPN Cricinfo". Cricinfo. Retrieved 7 June 2016. ^ "The Oval | Kennington: Introduction and the demesne lands | British History Online". www.british-history.ac.uk. At para 18. Retrieved 26 June 2016. ^ "London | The Duchy of Cornwall". At para 5. Retrieved 26 June 2016. ^ a b "Before The Beehive | The Montpellier Tea Gardens, Walworth". - History | www.thebeehivepub.london. At para 14 (Last paragraph). Retrieved 7 June 2016. ^ a b c "The Oval | Kennington: Introduction and the demesne lands | British History Online". www.british-history.ac.uk. At para 19. Retrieved 26 June 2016. ^ a b c "Oval Cricket Ground". vauxhallhistory.org. At para 1. Retrieved 27 June 2016. ^ Montgomery, Henry Hutchinson (1889). "The History of Kennington and Its Neighborhood: With Chapters on Cricket Past and Present". p. 173. Retrieved 4 September 2016. ^ "The Oval | Kennington: Introduction and the demesne lands | British History Online". www.british-history.ac.uk. At para 20. Retrieved 26 June 2016. ^ "Hundred years of Surrey cricket". At "The Oval in 1845", paras 2- 4. Retrieved 27 June 2016. ^ "The Oval | Kennington: Introduction and the demesne lands | British History Online". www.british-history.ac.uk. Paras 20- 22. Retrieved 26 June 2016. ^ "National Museum of Australia – Aboriginal cricket team". www.nma.gov.au. Retrieved 7 June 2016. ^ "England Players – Charlie Alcock". www.englandfootballonline.com. Retrieved 7 June 2016. ^ Cantrell, John (2013). Farokh Engineer From the Far Pavilion. Google Books: The History Press. ISBN 0750952539. ^ "A short history of the Ashes". Cricinfo. Retrieved 7 June 2016. ^ Morris, Christopher. Murdoch, William Lloyd (Billy) (1854–1911). Canberra: National Centre of Biography, Australian National University. ^ "Cricinfo – Test Matches – Complete List". static.espncricinfo.com. Retrieved 27 June 2016. ^ "Records / Test matches / Team records / List of series results". ESPN Cricinfo. Find and open "Zimbabwe in England". Retrieved 27 June 2016. ^ "Records / Test matches / Team records / List of series results". ESPN Cricinfo. Find and open "Bangladesh in England". Retrieved 27 June 2016. ^ "As if they were stretched outside The Oval or Villa Park..." Philip Larkin, "MCMXIV". ^ David Lemmon, The History of Surrey County Cricket Club, Christopher Helm, 1989, ISBN 0-7470-2010-8, p197. ^ "Cricinfo – ODI Matches – Complete List". static.espncricinfo.com. Retrieved 27 June 2016. ^ "HowSTAT! World Cup Match List by Country". www.howstat.com.au. Retrieved 27 June 2016. ^ "ICC CHAMPIONS TROPHY (2004)". Results | Global | ESPN Cricinfo. Retrieved 27 June 2016. ^ "[Deathwatch] John Paul Getty II, billionaire, 70". Slick.org. 17 April 2003. Retrieved 11 November 2013. ^ "End of an innings: Time called on Oval landmark". Telegraph.co.uk. Retrieved 7 June 2016. ^ "Listed status for The Oval's Victorian gasholder – BBC News". BBC News. Retrieved 7 June 2016. ^ "Inzamam charged by ICC". The Guardian. 21 August 2006. ^ "Cricinfo – As the chaos unfolded". Content-uk.cricinfo.com. Retrieved 18 August 2014. ^ Ahmed, Qamar (27 July 2017). "The Oval stages its 100th Test". DAWN.COM. Retrieved 31 July 2017. ^ "England v South Africa: Moeen Ali hat-trick wraps up hosts' victory". BBC Sport. 31 July 2017. Retrieved 2 January 2019. 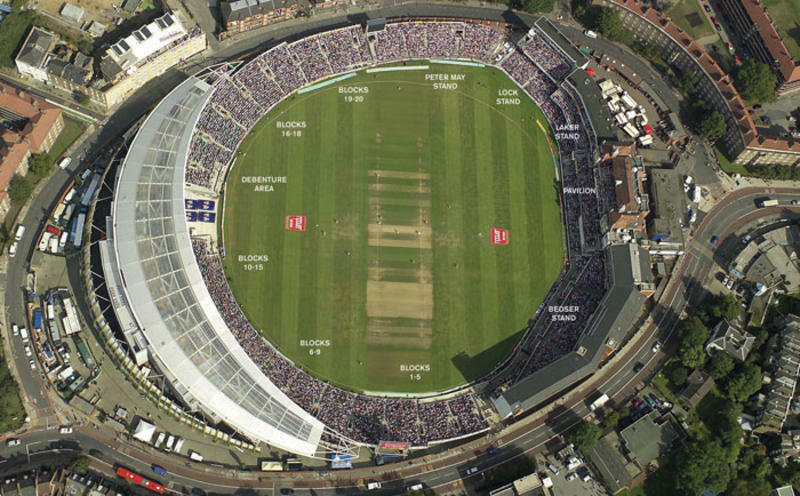 ^ a b "Ground Map – Kia Oval". Kia Oval. Retrieved 7 June 2016. ^ "Getting To The Kia Oval – Kia Oval". Kia Oval. Retrieved 7 June 2016. ^ Wright, Graeme (2011). Behind the Boundary: Cricket at a Crossroads. Google Books: A&C Black. p. 110. ISBN 1408165120. ^ "Kia Oval | POPULOUS". POPULOUS. Retrieved 7 June 2016. ^ "Populous". Retrieved 29 July 2016. ^ a b "Surrey unveil new plans for Oval". BBC. 18 January 2007. Retrieved 7 June 2016. ^ "Oval gets all clear for permanent floodlights". Cricinfo. Retrieved 7 June 2016. ^ "Lord's and Oval to get telescopic floodlights". Retrieved 1 July 2016. ^ "The Brit Oval, UK – Case study". www.abacuslighting.com. Retrieved 7 June 2016. ^ "OCS Stand Construction Update – Kia Oval". Kia Oval. 11 October 2013. Retrieved 7 June 2016. ^ "New Peter May Stand To Be Built This Winter – Kia Oval". Kia Oval. 5 August 2015. Retrieved 7 June 2016. ^ "Surrey Announce Kia Oval Redevelopment – Kia Oval". Kia Oval. 13 August 2015. Retrieved 7 June 2016. ^ Football grounds Corinthian-Casuals F.C. ^ "When and where was the first football match held?". The Times of India. Retrieved 11 November 2013. ^ "A Sporting Nation – The first international football match". BBC. Retrieved 11 November 2013. ^ When Saturday Comes: The Half Decent Football Book. Google Books: Penguin UK. 2006. ISBN 0141927038. ^ "Details of the 1872 FA Cup Final" (PDF). Innotts.co.uk. Retrieved 11 November 2013. ^ Brown, Alf (30 October 1972). "Carlton won match, but not the English". The Herald. Melbourne. p. 24. ^ "Port Adelaide wins AFL exhibition game against Western Bulldogs in London". News.com.au. 4 November 2012. ^ Sean O'Hagan, Gasworks wonders…, The Guardian, 14 June 2015. ^ "Stop N to Lockwood House – Google Maps". Maps.google.co.uk. 1 January 1970. Retrieved 11 November 2013. ^ "Stop Q to Kennington Oval – Google Maps". Maps.google.co.uk. 1 January 1970. Retrieved 11 November 2013. ^ "S Lambeth Pl to Kennington Oval – Google Maps". Maps.google.co.uk. 1 January 1970. Retrieved 11 November 2013.